It seemed eerie and yet fitting that as I was rushing to get to Ford’s Theatre I was delayed by a major traffic jam as the President was attending an event downtown. People were lining the streets to catch a glimpse of the man who counts Lincoln as a guide, and I was on the way to see a tech rehearsal of a musical on the Civil War, in the theater where Lincoln fell. Sometimes the line between the present and the past in this town gets blurred in a truly palpable way. It’s manifest in the remarkable renovation of this living museum. 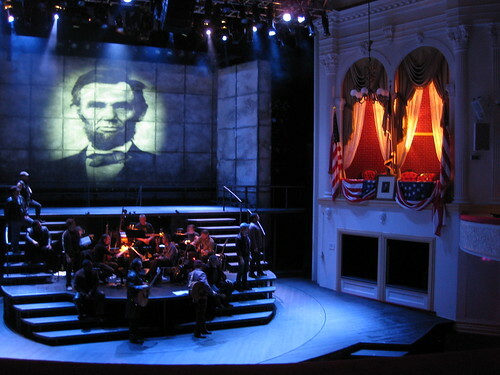 Ford’s Theatre’s reopening season continues this month with “The Civil War,” a Tony-nominated musical opening tonight and in performance through May 24. I’m very impressed by the renovated space. Last time I saw a show in this theater it was a bit clunky, and that’s being charitable. Now they are up-to-date, with all new lighting, sound and visual equipment – it’s a bit snazzy actually! And those infamously uncomfortable seats and obstructed sightlines are a thing of the past. It looks to be an admirable job updating the theater while maintaining its historical and monumental status. With all the tourists pouring into our city this week, I hope many of them take the chance to see the renovations and catch a show. “The Civil War” sounded quite rousing musically, a little bit bluesy, with some incredible vocalists, live musicians, and moving visuals. Get some important history mixed in with your cherry blossoms. The obstructed sightlines are still a thing of the present actually, as I learned when I saw “The Heavens Are Hung In Black” there recently. There are still seats in both the balcony and on the ground floor where the view is partially obscured due to the presence of supporting columns. It’s a bit like seeing a play at Fenway Park in that regard. If they staged that play as a straight-on proscenium, then I can see how the columns would still be an issue. However “The Civil War” is staged as a thrust which opens up the view more, and I didn’t think the colums posed a sightline problem. But, definitely noted. They cannot move or remove the columns due to structural issues. so if it bothers you be aware. I think they’re aware of the issue and they seem to avoid selling the most obstructed seats when they can. I got stuck in one of the upstairs obstructed seats briefly because I arrived late and they won’t open the doors to let you enter the ground floor part until intermission because it throws a lot of light into the theater. So my obstructed view was basically my own fault.